Saving enough money for retirement can be a tricky proposition even under the best circumstances. But when some of those dollars are being siphoned away by hidden – and perhaps unnecessary – fees, then the path to a secure retirement becomes even more difficult to navigate. Even small fees can have a major impact over time, which is why people need to be aware of what they are being charged, and whether other options exist that make for a better and smarter investment, says Casey B. Weade, a retirement-planning professional and author of the book “The Purpose-Based Retirement” (www.purposebasedretirement.com). Weade says those hidden fees, which are abundant in the financial industry, are his No. 1 frustration with the profession. “There are a couple of products that consistently illustrate the problem with hidden fees – mutual funds and variable annuities,” he says. “Many people believe their retirement advisor only makes money when something is bought or sold. But that’s not always the case. o Loads. Different classes of mutual funds have different types of loads or charges that are similar to commissions in that they compensate the financial professional for selling the fund to you. Some are front-end and you are charged at the time you make your initial investment. That charge usually is about 5 percent. Others are back-end, meaning you are assessed the charge if you sell the mutual fund, usually within a specified timeframe. o Expense ratios. Other than loads, this is the only cost many retirees and pre-retirees are aware of, Weade says. The expense ratio is used to pay distribution costs, administration fees, management fees and marketing costs. The expense ratio can be 1 percent or more, depending on the mutual fund. According to the Investment Company Institute, the average expense ratio in an equity mutual fund is 1.4 percent per year. o Advisory fees. In addition to the internal costs of owning a mutual fund, you may be paying a management fee to your advisor, Weade says. This fee can range anywhere form 0.25 percent up to 2.5 percent. Even if you aren’t aware of it, you should be able to determine how much this one is costing you because it is required to be disclosed on investor documents. o Soft dollar costs. One of the most difficult mutual fund expenses to uncover is soft dollar costs, Weade says. Often, mutual fund managers are provided software, education, research or other services by brokerage firms. In exchange for these benefits, the brokerage house gets the brokerage business and may charge a higher commission for the trading of stocks within the fund. That commission is paid by the investor. o Tax Impact. Mutual funds are pass-through entities, meaning you pay tax on every transaction inside the mutual fund whether you benefited or not. The average tax cost ratio for stock mutual funds is 1 percent to 1.2 percent per year, according to a Forbes magazine article. o Trading Commissions. Potentially one of the largest undisclosed expenses inside a mutual fund is trading commissions. “Every time something is bought or sold within a mutual fund there is a commission charged and, believe it or not, these costs legally do not need to be disclosed,” Weade says. A Wall Street Journal article noted that a 2009 study of thousands of U.S. equity mutual funds showed that the trading costs investors, on average, 1.44 percent. Once you know about the fees and charges attached to mutual funds, you may be able to negotiate to lower some of them, Weade says. “I regularly audit investors’ portfolios and find expenses in excess of 3 percent annually,” he says. But he also often recommends “separately managed accounts” as an alternative to mutual funds because there are no loads and there is more transparency. Separately managed accounts are somewhat similar to mutual funds, but can be tailored specifically to the individual needs of the investor. Casey B. Weade is president of Howard Bailey Financial Inc. in Indiana and author of the book “The Purpose-Based Retirement” (www.purposebasedretirement.com). Weade, a retirement-planning professional, hosts Purpose-Based Retirement radio and TV shows in the Fort Wayne area. Weade graduated from Stetson University with a bachelor’s degree in Finance and as a member of the honorary finance fraternity Beta Alpha Psi. He earned the prestigious CERTIFIED FINANCIAL PLANNER™ (CFP®) certification in addition to being a Retirement Income Certified Professional® (RICP®). He is also an Investment Advisor Representative (IAR), as well as life, accident and health insurance licensed and Long-Term Care Certified. NASA measures sea level rise from space, and the outlook isn’t good. In less than 25 years, the world’s the global sea level has gone up an average of three inches (eighty millimeters), and is rising faster than it was 50 years ago, according to a group of NASA scientists. Yesterday, NASA’s Sea Level Change Team shared some of their findings, which includes data on sea levels measured from space using satellites. Sea level rise isn’t evenly distributed around the world. In some areas, the sea has risen as much as 9 inches (23 centimeters), while in other places the sea level has dropped. For example, on the West Coast of the United States sea levels have actually been lower over the past 20 years, due to temporary ocean cycles. But when these cycles end, the impact of climate change is expected to be seen. NASA predicts that oceans will continue to rise at a considerable rate, about 0.1 inch (3.21 millimeters) per year on average. In 2013, the UN Intergovernmental Panel on Climate Change (IPCC) predicted sea level rise would be between one and four feet(0.3 to 1.2 meters) by the year 2100. NASA’s data suggest the higher end of the range. “It’s pretty certain we are locked into at least three feet of sea level rise, and probably more,” said Steve Nerem of the University of Colorado during the live streamed event. Sea level rise is driven by a number of factors related to global warming. As ocean temperatures rise, water expands and creeps up on land. Melting ice sheets, such as in Greenland and Antarctic, also add more water to Earth’s oceans, as well as water frommelting mountain glaciers. photo credit: An illustration of a wormhole in action. edobric/Shutterstock. Scientists have developed a magnetic system that mimics the behavior of a wormhole – theorized to allow space-time to be bent, and vast distances to be traveled in an instant – but it absolutely is not an actual wormhole, so don’t get too excited. However, what they did, which was to make a propagating magnetic field invisible, is actually very interesting. You can get excited again. The research, by a team from the Autonomous University of Barcelona (UAB), was published in the journal Scientific Reports. They describe how they created a small sphere about 45 millimeters (1.8 inches) across, made of a spherical ferromagnetic (one that can become magnetized) surface, a spherical superconducting layer, and an inner ferromagnetic sheet wound in a spiral. The superconducting layer was made of superconducting strips glued to a sphere, and the entire device needed to be submerged in liquid nitrogen for the superconductor to work. The magnetic field was supplied at one end by a current passing through a coil. 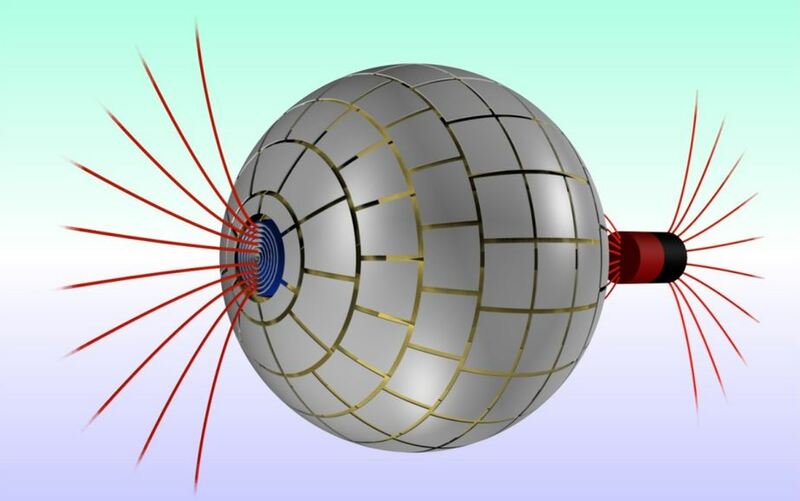 When the magnetic field entered the sphere at one end, the researchers showed how it would appear at the other end as an isolated monopolar-like field – but within the sphere itself, there was no trace of the magnetic field. The dual-layered design was responsible for making the magnetic field invisible; the attraction and repulsion of the magnetic field was cancelled out, making it undetectable. “Our wormhole transfers the magnetic field from one point in space to another through a path that is magnetically undetectable,” the researchers wrote in their paper. “It disappears in one point and reappears in a different point, as if it were travelling through another dimension,” lead researcher Alvaro Sanchez added to IFLScience. Shown is an illustration of the field entering the sphere, left, and passing out, right, like a “wormhole.” Jordi Prat-Camps and Universitat Autònoma de Barcelona. Why is this important? It means that the magnetic field could travel from one side of the sphere to the other without producing any noticeable effects. If you placed a magnet inside the sphere, it would not be influenced by this propagating field at all. Of course, in this case the magnetic field is actually very much there in the sphere – it’s just not detectable. In an actual theoretical wormhole, an object would disappear at one point in space-time and reappear at another. So this isn’t quite the real deal. The team now wants to study the same effect using different geometries. For example, they might try and use a cylinder instead of a sphere to recreate the effect, to highlight some of the more practical applications for the technique. Is Amazon really so evil? There’s nothing new about the way Jeff Bezos is running Amazon. Amazon started with books, and it was genius: There are tens of thousands of books, so much choice that they can be hard to find. Before Amazon, bookstores were more numerous but inefficient, and since books are small and easy to ship, the business was prime for disruption. It was brutal. First bookstores tried consolidating into big boxes to gain efficiency. Squeezed between online shopping and Borders or Indigo, the independent bookshop (including one I owned a piece of) was pushed over the edge. It’s hard to compete with the Frederick Winslow Taylor of our day, Jeff Bezos of Amazon. Employees hated it; Labour leaders organized around it. Taylor got fired from Bethlehem Steel because the other managers couldn’t deal with his process. Because unlike Bezos, Taylor didn’t own the company. Many are outraged by this article. Katie Herzog of Grist is never shopping there again. On Vox, Dylan Matthews suggests that the outrage is misplaced; the ambitious white-collar workers in Seattle have options, but the blue collars in the warehouses — who are collapsing in the heat — do not. He misses the point. Jeff Bezos would rather not have anyone working in the warehouses at all. It would be much better if the warehouses were run entirely by robots — and that’s where it’s going. I have no doubt he would do the same with his office workers too. Unlike Facebook or Google, Amazon is competing with real retail brick-and-mortar stores. It does it by being relentlessly efficient, cutting costs every way it can. That’s what Taylor proposed 150 years ago and what Bezos is doing now. And many people find it convenient and cost-effective. Taylorism is now an accepted part of life, seen in the way they build hamburgers at McDonald’s or cars in Detroit. I wonder if Bezoism isn’t more honest than Silicon Valley companies giving employees massages, laundry service and free food so that they never leave the office. At least in Seattle you have to go home to eat and have a shower occasionally. I used to love going down to the bookstore every Saturday, finding some new surprise and buying it. I still love the smell of bookstores, and I visit every time I can. I silently cried with happiness when I recently visited an architectural bookstore that still survives in Seattle, home of Amazon. But when I wanted to review a book for a post earlier this week, I did the one-button thing with Amazon and had it in seconds. The author of the book was able to get it out into the marketplace without the costs and delays in the old-fashioned publishing world that Amazon turned upside down. You lose some and you win some. Amazon bills itself as the Everything Store, and it doesn’t seem too far-fetched to imagine a time when literally everything that we purchase comes from this single company. This is terrifying, the kind of monopoly our government would break if our government still did that kind of thing. I am not so sure. It’s more likely that something will come along and disrupt Amazon the way it disrupted Walmart, which disrupted Sears. Maybe workers will get tired of being treated this way, as they did in Taylor’s day, and organize into unions. Maybe customers will decide to support their local stores and markets instead of ordering online, because they realize that those businesses are critical to building a healthy neighborhood. Maybe people will finally realize that they and their kids need jobs that won’t exist if everything is packed by robots and delivered by drones. Fredrick Winslow Taylor died at 59, a bitter, angry and broken man after battling with labor leaders, famous authors like Upton Sinclair, and congressional investigations into his management systems. I don’t think Jeff Bezos will suffer the same fate, but he’s only 51. It’s too soon to tell. The Better Way to Bust Dust: You’re going to need more than a few feathers on a stick. Put beanbag critters, teddy bears, or fabric dolls into a large plastic bag with a cup of baking soda. Secure the top, then take outside and shake well. The baking soda and static will draw out the soil and dust. Remove items one at a time, shake off the clumps of baking soda, and vacuum the rest using a brush attachment. Over time, crumbs, grease, and other debris accumulate in these areas, providing a food source for insects and other pests. If possible, move the appliance out from the wall and unplug. Use a long-handled, slightly damp sponge mop to lift dust from the back of the appliance, then wipe floor and walls with hot soapy water. Remove heavy dust from ceiling, floor, or appliance vents with a soft-brush vacuum attachment or electrostatic mop, then dampen a microfiber cloth and wipe the surface. Rinse removable, washable air-conditioning filters well in hot soapy water and air-dry before reinstalling. Place newspaper or a drop cloth under a ceiling fan. Turn off the power source, then get on a step stool. Use damp paper towels to wipe greasy dust from the casing and a soft-bristle brush dampened with a mild cleanser to loosen the dust on the blades; rinse with a damp paper towel. A town in Massachusetts decided to stop arresting drug users. 2 months later, here’s how it’s going. Back in June 2015, Gloucester, Massachusetts, police chief Leonard Campanello announced that his officers would no longer arrest drug users who approached them seeking help. Instead, the department announced they would refer the drug users to treatment, and front the cost. Gloucester has been struggling to combat a big heroin problem. Between January and March 2015, the community experienced four overdose deaths —more than in all of 2014. Needless to say, there were many questions about whether Campanello’s experiment would actually work. How much money would it cost? Would it actually reduce the number of overdose deaths? Would drug users actually trust the police, knowing that admitting to possession could technically get them arrested at any time? After two months, the early results are in, and they look promising. Very promising. “We’ve built partnerships with treatment centers, health plans, health providers, other law enforcement, and certain the public, which has overwhelmingly supported this approach,” he told Upworthy. As a result of the positive early signs, Campanello and his team are working hard to take the program nationwide. As with any new program, there are still a few kinks to work out. Even after the initiative took effect in June, the epidemic of overdose deaths in Gloucesterhasn’t completely subsided. And given the outside-the-box nature of the program, there is still a lot of legal red tape to work through. But progress has to start somewhere. Photo by Darren McCollester/Getty Images. And 100 people who would otherwise be sitting in jail now have a chance to repair their lives. With nonviolent drug users popping up in prison at alarming rates, it’s great to see evidence that when you treat addicted persons like people instead of criminals, good things can happen. Disposables are increasingly being touted as a green alternative to washing. Cloth diapers and dishes are two things that were commonly washed and reused on a daily basis, but now a growing number of people, particularly in drought-stricken regions such as California, are turning to disposable versions because they think it uses less water. Unfortunately, that’s not the case. I’ve received several emails and comments from readers who have read my stance on reusables and are left feeling confused by the conflicting messages they’re hearing from all sides about water usage. While these are valid concerns, they tend to overlook the fact that large amounts of water are used to produce the very disposables that are supposed to be reducing the amount of water we use. In a book called “Your Water Footprint,” author Stephen Leahy explains that cloth diapers, despite needing regular washing, are much greener than disposables. The water footprint of a reusable diaper is 15 liters (4 gallons), assuming it’s used 50 times. The water footprint of a single disposable diaper is 545 liters (144 gallons), and it’s estimated that people who use disposable diapers will go through about 8,000 of them for one child. As for disposable dishes, consider that it takes 2.6 gallons of water to produce a single sheet of paper. Then there’s the added energy cost of production, packaging, and transporting to stores and homes and away to landfill, where disposable plates and cups – which can be made of plastic, Styrofoam, virgin wood fibers, plastic-coated paper, post-consumer recycled fibers, or agricultural waste products such as bagasse, and are usually non-recyclable because they are contaminated with food residue – will sit for hundreds of years, slowly decomposing and releasing methane gas. “The production of Styrofoam cups has a much lower environmental impact than the other two in terms of resource extraction and GHG emissions [but it’s often non-recyclable]. But since the Styrofoam cups are disposable, you need a new one every time you have a cup of coffee. The environmental impact then adds up until, at 46 uses, the ceramic mug becomes the environmentally responsible choice. “After 369 uses, the stainless steel mug also becomes a better choice than Styrofoam [and] 24 paper cups are equivalent in material intensity to a stainless steel mug. It’s difficult to calculate all the factors that affect an item’s total sustainability measurement, including “the recyclability of materials, their toxicity, the biodiversity of the raw material extraction site, and the working conditions along the supply chain,” but as long as you’re efficient about washing dishes, not running the dishwasher unless full, using non-toxic detergent, and not stuffing your kitchen cupboards with far more reusable dishes than you’ll ever use, reusables continually win out over disposables. Some advice I like is, “Think single purchase, not single use.” The less water- and other resource-intensive production that is driven by our materialistic, disposable-inclined purchasing, the better off we’ll all be.